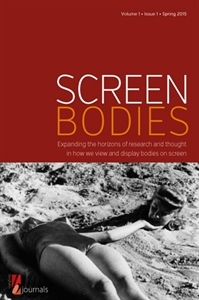 Screen Bodies is a peer-reviewed journal focusing on the intersection of Screen Studies and Body Studies across disciplines, institutions, and media. It is a forum promoting the discussion of research and practices through articles, reviews, and interviews that investigate various aspects of embodiment on and in front of screens. The journal considers moving and still images, whether as entertainment or for information through cinema, television, and the Internet; through the private experiences of portable and personal devices; or in institutional settings such as medical and surveillance imaging. Screen Bodies considers the portrayal, function, and reception of the body presented and conceptualized through the lenses of gender and sexuality, feminism and masculinity, trans* studies, queer theory, critical race theory, cyborg studies, and dis/ability studies.